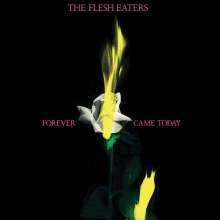 Der Artikel The Flesh Eaters: Forever Came Today wurde in den Warenkorb gelegt. In the wake of the star-filled A Minute To Pray A Second To Die, The Flesh Eaters' frontman Chris D. assembled a leaner, meaner band to deliver his next unbound vision. Forever Came Today, the group' s third full-length album, was originally released on Ruby Records in 1982 and features Don Kirk on guitar, Robyn Jameson on bass, Chris Wahl on drums, Steve Berlin on sax and Chris D.'s unmistakable voice. »My Life To Live« and »Shallow Water« are masterfully wrought punk tunes, reverberating with heart-wrenching vocals that turn on a dime from desperate whispers to blood-curdling screams. »Drag My Name In Mud« dives deeper into full-throttle rock demonology, bluesy primeval swagger and obsessive imagery, inspired in equal parts by William S. Burroughs and Edgar Allan Poe. This first- time vinyl reissue has been carefully remastered and comes with lyric sheet. Forever Came Today is the perfect introduction to The Flesh Eaters' dark sense of humor and positively bleak form of rock 'n' roll.